My career so far has taken me from the Christchurch rebuild to the Beehive, through NGOs and social enterprises to now running my own strategy, change and communications consultancy. I believe the future of work is purpose-led with people we like, when and where we want, so I’m walking the talk and helping others do the same. I’m a feminist, changemaker, and a champion for women in leadership and the power of a millennial mindset. I love living in Christchurch with the emerging new city, thriving innovation ecosystem and proximity to the mountains for trail running and ski touring. Leadership NZ has been a transformational experience for me at a pivotal moment in my personal journey. I feel so privileged to experience the aroha from our incredible Leadership NZ 2018 whānau who have challenged and supported me in so many ways. I have particularly enjoyed our triad/quad groups and the gift of peer coaching that Louise and Nicola have helped us give each other. I’ve also expanded my appreciation for Te Ao Māori and my own responsibility as a leader in Aotearoa. The biggest change I’ve noticed in myself is a sense of selfassurance and calm – decision making has become easier as I learn to trust the process and my intuition. I have a renewed faith in the potential of awakened leadership for our people and planet. I believe the Leadership NZ model of creating a sacred space for us to have important conversations and grow together is a powerful force. I bring nearly two decades of professional experience of educational leadership and sector development, working for and with young people in many different contexts. In my working life, I have worked to amplify young New Zealanders’ agency, voice and strengths. I am interested in the deep connections between young people’s wellbeing, their economic participation, democratic engagement and contribution to their communities. In 2018, I was appointed as CEO of the Prince’s Trust New Zealand. I am a fierce believer in collaboration being the key to creating the environment where young people will reach the stars that belong to them. This has been an incredible year of learning for me, a process that I’ve been privileged to undertake in the company of a wildly diverse group of thinkers, leaders and changemakers. Over the course of the year this Programme has expanded my world and I’ve grown as a result. I’ve witnessed extraordinary transformation in my Leadership NZ whānau. Changes big and small. Realisations and learnings have arrived with all of us. Some have come like bolts of lightning and others slow growing. Together we’ve taken audacious leaps into the unknown, fallen hard, gotten up, tried new things and figured out what’s important. We’ve spoken, we’ve been deeply heard. Leadership NZ has been generative, challenging and inspirational. Let us cast out lines with firm feet, into the depths, in the hope that the ripples we make will create waves beyond change simply in ourselves. For the past 15 years I have worked, enjoyed, discovered, challenged, prayed, contributed and grown for a wonderful organization – Te Ora Hou. I found my feet here, my calling and another reason. I have led teams here, done big projects, some national, some collectively and some regional. I have worked alongside whānau and young people that have challenged my focus to the core. I have witnessed violence, hardship, poverty and shame. But I have also witnessed kindness, grace, achievement, possibility, hard work and above all LOVE. People are amazing, we all come with this landscape, that has been tended to differently, I think with some time and love, these landscapes change. How? That is the story. I love how the possibility of an opportunity can fundamentally change our internal compass. Pūmanawa Kaiārahi o Aotearoa has done this for me. It has pulled out years of habit, mindset and ways, to put them in a bag, love on them, shake them up and re-align them to my true north. From the cohort, to the Leadership NZ team, to the guest speakers the level of honesty, excellence, wisdom and love has truly been mind-altering. Often this year I have just sat and looked at this cohort and thought what an absolute privilege to share growth with such an inspiring group. Kia kaha ngā Kaiārahi o Aotearoa. My mum’s family started arriving in New Zealand in 1842, while my dad’s family came out from Scotland in 1951. Collectively, they worked hard to help build our country as surveyors, soldiers, journalists, typists, cleaners, welders, parents, and public servants. For my part, I’ve worked as a Crown prosecutor, a commercial lawyer, and as a diplomat and trade negotiator. It’s a huge privilege to represent New Zealand offshore and, in my current role, to help Kiwis who need consular assistance around the world. I’ve been incredibly fortunate to have my wife Diana and our three fantastic children, participate in these adventures with me. He aha te kai o te rangatira? He kōrero, he kōrero, he kōrero. I’ve always liked that whakataukī - what is the food of a leader? It’s conversation, it’s dialogue, it’s discussion. And that’s what Leadership NZ has offered us this year. Every session has been a feast of ideas, perspectives and insights. Practical ideas about how to improve as a leader. New perspectives about our society and culture. And real insights about what we can achieve if we have the courage and determination to try. Two things have stood out for me: the extraordinary qualities of the other participants; and the fact that we don’t talk much about leadership theory in the abstract at Leadership NZ – we talk about how to develop as individuals and as a nation. Thanks for getting me going, Leadership NZ, and thanks to my family, friends, and MFAT for supporting me along the way. Karawhiua! I grew up in Auckland and I love that I am now working for an institution that is impacting our city for the benefit of all, especially our young people. I am excited to be creating a sustainable research culture at AUT University. While I trained as a lawyer, I spent a large chunk of my career working in publishing in London. Contract negotiation and relationship management has been the consistent theme across my varied roles. When I am not at work I am being taught how to lead and influence by my two fabulous sons and a dog named Rafa. Participating in the NZ Leadership Programme has been a wonderful experience for me. I didn’t know what to expect but I knew I did not want an academic programme that taught me leadership theory but didn’t help me to implement it in a practical way. I have loved the experiential, reflective approach offered by Leadership NZ. The Programme has challenged my understanding of what leadership is and helped me shift perceived blocks to developing new skills. It has impacted every aspect of my life and it has been enormous fun too. Along the way I have been advised, inspired and awestruck by my fellow participants. The Programme has taught me to appreciate challenges as opportunities for growth – so I am excited about what is around the next corner. I was born in England, attended school in Christchurch and now call Waiheke Island home where I have lived for the last ten years with my family. An opportunity to work for Britain’s National Endowment for Science, Technology and the Arts (NESTA) in London introduced me to the power of innovation and creativity to change the world. I have been fortunate to work alongside a dedicated and passionate team of people at Foundation North where collectively we are working to find innovative ways to create positive impact for the communities of Auckland and Northland. I started The NZ Leadership Programme with a commitment to remaining open to where the year may take me and what it may bring. And what a journey I have been rewarded with. It has been transformational to be part of such a diverse and talented group where we have formed such strong links and bonds. Where we have supported, shared and learnt from each other. The NZ Leadership Programme approach is unlike any other leadership programme I have been part of. The kaupapa of personal growth with the application of practical tools and skills is a potent combination. As we near the end of the Programme I have a feeling that I will be reflecting back on this year as I continue to apply what I have learnt. I come away with a deepened sense of purpose for how we can all contribute to heal ourselves, others and our planet. I am a proud New Zealander, born, raised and still living in Auckland’s west. My professional qualification and early working career was as a Chartered Accountant. My current role focuses on business transformation and ensuring programmes contribute to our strategic goal and imperatives. I also have an interest in developing and training across our organisation and take pride in being part of organisational transformational change. I lived and worked in the UK for 10 years which gave me exposure to different sectors including social housing and the charity sector. The Leadership NZ Programme has strengthened my resolve to make a positive difference and give back to my community. It has been a privilege to be on the Leadership NZ journey; this unique Programme has delivered and inspired in so many ways. Access to some of New Zealand’s thought leaders, wonderful and supportive facilitators and the Leadership NZ team and an intelligent and inspiring cohort from varied industries and sectors bringing diverse life experiences and points of view all combined and added so much to my Leadership NZ journey. I will look back fondly on the varied and sometimes emotional discussions the cohort undertook on the challenges facing New Zealand; true diversity of thought in action. But most of all the Programme was a chance to take time to reflect and a chance to continue my personal leadership development journey towards a more empathetic, hopefully more human, and certainly more authentic leader. What brought me to this wonderful country five years ago was aroha, and I could not be any happier to call it my home. There is something eally special about New Zealand that makes it an amazing country to live in with its beautiful scenery, diversity and can do attitude. Most of my career has been spent working within the public sector for international business development agencies helping businesses realise their international growth potential. I am very passionate about this field and proud to help our big and small Kiwi companies make a difference and succeed internationally. I feel very fortunate to have been part of the 2018 Programme. For me the Programme has been a life-changing experience that has challenged and motivated me to uncover who I am as a person and as an authentic leader. Every session has brought different learnings, opinions and worldviews that have challenged and enabled me to build a better understanding of the challenges faced by New Zealand and its people. I have been enabled to peel away all the layers that have shaped and influenced me over the years (both negative and positive); I feel now that I have a better understanding of myself – how I came to be the way I am and the historical biases I bring to situations. This understanding has helped me to better manage myself in challenging and uncomfortable situations, and to consider the deeper motivations behind others’ behaviours. The Programme has enabled me to uncover my authentic self and my true values and equipped me with the tools and principles to continue developing as a leader. Born and raised in the Sonoran Desert of Arizona, I am at home on the south coast of Wellington with my wife and two little girls. As the Manager of Community Resilience at WREMO, I am part of a team that is reshaping how Emergency Management empowers communities to be better connected and prepared for disasters. I love my work because it is meaningful, fascinating and ripe for innovation. In a past life, I worked in humanitarian aid, was a Peace Corps Volunteer, guided whitewater rafting expeditions and advocated for community housing. Also, I know a good taco when I see one. The Dude’s opening line in The Big Lebowski might as well be the subtitle to Leadership NZ’s Awakened Leadership theme. I spent each session and the weeks after looking inward, challenging myself. I usually left with questions I didn’t know I had questions for and gaps where I had anticipated an answer. And, through some of the most heartfelt dialogue I’ve ever experienced, a clearer appreciation of who I am and how I interact with the world emerged. All of it. Growing up in a small town in the King Country, I had an appreciation for people’s talents and strengths and the effect they had on the community. My current role in Auckland Council allows me to link with policymakers, the front line and service people who share the same collective goal of bettering the lives of our communities and citizens. I have a passion for innovation that’s achieved through the collaboration of others, understanding their life experiences and worldviews. We have the potential to achieve great outcomes if we share a common vision and persevere. The challenge and profound journey of Leadership NZ has made 2018 a year I will treasure forever. It’s created the fundamental turning point in my life; a new passion, skillset and emotional connection I’ll forever be grateful for. From the first day, I felt the uneasy tension of uncertainness being churned inside, wondering how these ‘far-out’ concepts could be applied to my professional leadership. However, the concepts continue to land as deeper connections are formed with some of New Zealand’s diverse and talented leaders who are also on this journey. The wisdom and energy reflected in experiences shared by fellow colleagues, the speakers and facilitators really opened my eyes (and heart) for wanting more. More for myself, more for the organisations I support and more for Aotearoa, this paradise we call home. The awakening has happened, but the journey is just beginning – I’m hungry for everything the future holds. My wife and I immigrated to New Zealand from the UK with our two sons when I was offered and accepted a role as a Building Physicist in 2008. Prior to obtaining my degrees, I held roles in construction, catering, started three businesses and toured North America by motorcycle for a year where I caught the science bug. My diverse background has provided the opportunity to develop my technical and soft skills. In my current role, I am able to identify late-stage research which may be transferred from the lab to solve real-world problems to protect and grow New Zealand’s primary industries. It was a much-valued privilege to be selected as a participant for the NZ Leadership Programme and to be supported by the Ministry for Primary Industries. As a result of workshops and creative facilitation I now have the tools and understanding of what makes me me and have grown from the experience. It wasn’t easy or comfortable at times, but it has enabled me to truly understand my own beliefs and how I affect and influence other’s behaviours. I probably have more questions now than answers as a direct result of the Programme, and this is in line with this year’s theme of “Awakened Leadership in the Future of Work.” I have remolded my thinking, taken learnings and applied them with fresh optimism to my personal and professional life as I move forward better equipped into an uncertain but exciting future. I consider my upbringing in Māngere South Auckland as my greatest qualification. After a “road to Damascus” moment at university, I left my place in a conjoint degree to enter into youth work. My youth work practice grew to include community development and community action with particular success in connecting marginalised voices to policy processes. A growing passion for brokering conversations of change and drawing insights from differing worldviews led me on a path to explore indigenous approaches to personal and professional learning. It was through that passion that I co-founded the social enterprise Tū Moana. This has been a year of sitting on the many shores of Aotearoa, allowing wave after wave to wash over me. Some a gentle lapping, some an unexpected crash of spritely saltiness. As the magic of the previous shore would spill over the landscape of old habits and outdated understanding, another would arrive, generously crested with insight and truth, leaving me completely present to what is awakening in and around me. I am awakening to the truest version of me. Awakening to healing and being awake to the trauma in our world and challenged to not only lead with an awakened mind but an awakened heart. I’ve worked in the community sector for the past eight years as part of non-profit and social enterprise organisations. In my current role at EcoMatters, my team creates experiences to connect Aucklanders with our environment, and inspires and supports them to live more sustainably. I enjoy the challenge of working in a non-profit, trying to achieve big change with little resources. I also love collaborating with businesses and other organisations on projects. When I’m not working, I’m most likely to be reading, out in the garden, enjoying local community events, and spending time with my partner and our young son. It has been a huge privilege to participate in the 2018 NZ Leadership Programme and to share the journey with a fabulous group of curious, open-minded, diverse, generous and fun people. It has been a year of profound insights, authentic connection, challenging viewpoints and deep reflection. My concept of leadership is now much richer. The terrain covered in the Programme was both broader and deeper than I expected, and I’ve gained much more from it than I could have imagined. I took on a new leadership role this year, by becoming a mother. I couldn’t have participated in the Programme as a new Mum without massive support from my partner Hayden, from EcoMatters, and from the Leadership NZ team, for which I am infinitely grateful. I finish the year filled with optimism for New Zealand’s future, knowing that my fellow participants are all committed to creating positive impacts across their spheres of influence. After ten years in the corporate IT world, I switched careers to work in international development, fulfilling a childhood promise to myself. Over the last 15 years I have worked in Cuba, Ireland, South East Asia and the Pacific for a wide range of development organisations. Having made so many mistakes along the way, I use simulations to teach students of development how to manage aid projects. I met my Kiwi wife in Timor-Leste, who took me via several waka to Solomon Islands, Tonga and finally New Zealand. I now work at the Embassy of Ireland in Wellington. Before we can lead others, we need to be able lead ourselves. To lead ourselves, we need to know where we are now and where we want to go – we need to know our values, and how congruent our current way of living is with those values. To lead others we need to clearly and firmly articulate our vision and how we want to achieve that. As we drive forward we need to take on board the perspectives and wisdom of our team. We rarely truly know the depth of experience – mostly hard-won overcoming adversity – of our fellow travellers. I was born and educated in the heart of the Waikato. I have travelled, living and working in the UK for 10 years before returning home to family and friends. The majority of my career I have worked in leadership roles within the insurance industry. I love working with teams creating a culture that motivates and inspires people to achieve our shared vision. My current role is at Earthquake Commission; I engage with a variety of people, teams and organisations across the country building relationships and helping New Zealanders get their lives back together and recover from natural disasters. Leadership NZ has been a truly awakening and enjoyable experience, an absolute honour and privilege to be part of. The group dynamics are amazing, the relationships built are engaging and gratifying. It has been extremely humbling to learn about all the different life voyages people have embarked on to bring us all together for this fabulous journey. I have been absorbed by the thought provoking speakers throughout the year. The challenging conversations and various viewpoints have been insightful. The leadership sessions with Louise have been rewarding and stimulating. The skills and personal development have been beneficial, and I will draw on them for a long time to come. I am continuously reflecting, rethinking the way I interact with others and the environment around me – challenging myself to make things better. Forever in my heart – ake i roto i tōku ngākau. I’m originally from Wellington. Home is now Auckland with my wife and two girls. I have spent most of my career with KPMG, working across a range of service lines in Auckland with a short stint in Brussels. I also spent time in London with GSK, integrating the finance function of a large acquisition. I am currently an Audit Director, working primarily with growing entrepreneurial New Zealand businesses. I also provide specialised advisory services to the construction sector, including co-leading the sector for KPMG. I’m passionate about working alongside my clients to help them achieve their strategies, ambitions and purpose while growing capability and passion in people. This year has been an extremely valuable learning experience, which I have been lucky enough to share with a great group of people. The space has been created to trust each other in sharing our experience and learning, whilst supporting and encouraging each other to contribute, but equally offering challenging and diverse thought. I feel like my self-awareness and resilience to grow into my future leadership challenges has been substantially enhanced. I have a much better sense of my connection to why I am doing what I am doing, a greater understanding and consideration for the people and communities I work with, an expansion of knowledge about New Zealand and its challenges and opportunities for the future. I’m CEO of an insurance company as well as Chairperson of Pūkorokoro Miranda Naturalists’ Trust; an environmental organisation focused on shorebird conservation. My volunteer work with shorebirds in China has really deepened my understanding of the importance of connections between individuals, groups and landscapes, between practicalities and ideals. I’m always interested in how to better build or deepen those connections. Who are you empowering? Who are you disempowering? Who are you not talking to? How do you live your values? They are just some of the questions that will stay with me after this year’s NZ Leadership Programme. My skill at inquiry, both internal and external, and my willingness to pay attention to the results of those inquiries, to trust my own judgement, have increased dramatically this year. I’m beyond grateful to the people on the journey with me, the other participants, the speakers and the Leadership NZ team for their willingness to let the rest of us learn from the parts of themselves that they might not normally share. I am a senior HR leader with extensive experience in the not-for-profit sector, leading large, multi-disciplinary organisations through innovative HR strategy and practice. 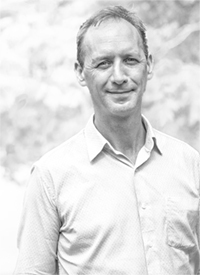 I bring a genuine passion for creating great places to work, engaging with staff, and contributing to organisations that have a strong focus on delivering meaningful outcomes to communities within New Zealand. At Presbyterian Support Northern I have instilled robust HR practice and policies that embrace these approaches and builds on the core values that make us great. Prior to this I worked in HR for the New Zealand Fire Service, overseeing the volunteer services division with 8,000 volunteer fire fighters across the country. The year with Leadership NZ has been an exciting journey, challenging my inner selfies and making me step outside the comfort zone to engage with our environment and futuristic thinking. The fabulously diverse group of leaders in our cohort who come from so many different organizations within NZ have enabled me to consider the wider implications of the day-to-day decision-making process and to truly awaken the leadership skills that are within all of us, making not just for an awakened leadership style for me but being able to share that with those around me. What has been wonderful from a personal level is to question the stories I hold on a personal level that have guided me for so long, challenging my internal paradigm and to identify a stronger more ‘intact’ perspective to move forward with. I am a qualified accountant and intelligence professional with experience working in the corporate and government sector in the UK and New Zealand. My career spans corporate finance, intelligence and data science. I have successfully motivated and have had the privilege to lead multiple teams of highly technical staff and am particularly passionate about growing our human capability alongside technological innovation. I am very much a “one-eyed Cantabrian” living in beautiful Christchurch with my husband and two young children. The NZ Leadership Programme has been an amazing experience for me that I know I will value and continue to gain from as my journey continues. I feel incredibly privileged to have been selected and have this opportunity to have journeyed with so many inspiring and talented leaders of our very own Aotearoa. This I will treasure for life! It challenged my own worldview of things and it awakened views and opinions of so much I had forgotten or was not conscious of. Awakened Leadership was our theme this year, and I never could have imagined my own awakening! I will be forever grateful to the Leadership NZ team for developing this fantastic programme that has allowed me to journey my own self-awareness as a human being and as a leader of Aotearoa. 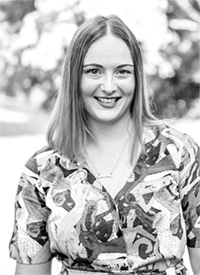 I began my career as a physiotherapist specialising in the treatment of work-related injuries. I then traversed through Health & Safety into generalist Human Resources roles where I have worked in a variety of businesses. My major areas of interest lie in organisational development, change management and developing leadership capability. I am passionate about creating inclusive work environments, where diversity is embraced and people are valued and supported to grow. I am also passionate about youth development, and my current role has allowed me to combine this interest with my career. I am mum to two “tween” girls – a role which continues to be my greatest youth development challenge! The NZ Leadership Programme is like no other leadership programme I have experienced. It is a journey which has challenged and developed me in ways I did not expect and deeply broadened my perspective and understanding of New Zealand’s social and economic environments. One of the wonderful gifts of this Programme is the diverse group of people it brings together. The wisdom shared by this group, as well as by the inspiring speakers and facilitators, all contribute to the Programme and create the ideal space to grow as a leader. I am excited about the future and the Programme has challenged me to think about how I can use my leadership skills to benefit Aotearoa. As I continue on my journey as a leader, I know that I will always cherish the learnings and experiences I gained through Leadership NZ. I originally came from Cape Town after serving 18 years in the South African Navy. I have been in New Zealand for nearly 18 years. Serving in the military gave me a great foundation in organisational behavior, management and leadership under the trying conditions of human combat. I have used these skills in array of positions, with the common element of growing people to achieve their full potential. I currently work in the field of building and construction apprenticeships, guiding a team to support young men and women on their learning journey to the final destination of graduating as a tradesman. I live in Auckland with Jane and our two children Greg and Ashleigh. I’m intrigued by leadership. It is hard to define, but you know it when you see it. The NZ Leadership Programme has confirmed many leadership concepts for me, thwarted others and drawn me into new territory and paradigms. The Programme encourages you to delve into areas that one would not normally look into and then to be challenged by giving and getting feedback in conversation. As they say regarding holidays – “It’s more the people you meet on holiday, than the places you visit that gives you the lasting joyful memories.” The same holds true for the Programme. My fellow colleagues have come from a diverse range of backgrounds and fields. This diversity allows you to address all the colours and all the sizes of leadership. I have been privileged to be part of a group of people who will not only support but also hold me accountable to make this world a better place. Current community involvement: Secretary of the Parish Pastoral Parish Council for Our Lady Star of the Sea; Steering Group of the Tamaki Redevelopment Commission; Member of the Franklin Skills HUB. I was born and raised in West Lancashire, UK. I fell in love with New Zealand whilst on my OE in 1993 and emigrated here three years later with my wife as newlyweds. Our children, Eva and Finn, now study in Auckland. In the UK, I trained as a quantity surveyor and gained experience in building and civil engineering, mainly in Liverpool and Manchester. In New Zealand, I retrained in civil engineering and in 1999 joined Auckland Airport. My airport experience has progressed from project management through to utilities asset management. Gardening, fishing and family fill my spare time. For me, it has been a real privilege to be a part of the 2018 Leadership NZ journey. I am truly grateful to Auckland Airport for giving me this opportunity. This year I have walked among giants. Guest speakers, programme leaders and the 2018 cohort; they all shared their wisdom and experiences always with honesty, openness and authenticity. It’s been a challenging, often confronting voyage. We explored diverse topics from New Zealand’s past through to our future on this planet. We also went on our own inner journey, a deep dive of self-discovery and acceptance. We were given the techniques and tools to grow and to shine. As this year’s journey draws to an end, I look forward to the future – more confident, positive, open, ready and awake. Thank you, Leadership NZ. I was born in Taumarunui where both sides of my family farmed next to the Whanganui River. Ko Whanganui toku awa. Growing up experiencing rural and semi-rural New Zealand I strongly identify with helping New Zealand grow. I have been privileged to do this through working with Auckland Airport and its international airline partners for the past 16 years. Spending time with my family growing strong sons has also been an extremely important part of my life. Looking forward, I want to enable others to have the same educational opportunities I was fortunate to experience. I leave the year with Leadership NZ more mindful than I entered it. More aware of my own values and foundations, more in tune with myself and my aspirations, more sure of where I can best make a difference to our communities. More aware of the importance of relationships and building common ground. More able to express, recognise and share my own vulnerabilities, strengths and emotions. More prepared to answer the phone! I am ready to set forth and become involved and make a difference where I am most able to and where I have a passion. I whakapapa to the Eastern Bay of Plenty tribes of Ngāti Pukeko and Te Whakatōhea, but grew up and live in Wellington. I’m a chartered accountant with 15 years’ experience. 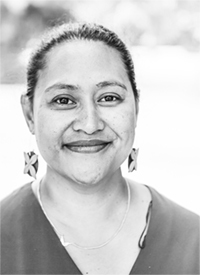 I was able to align my personal values and my professional life five years ago when I took on my current role as the Accountant at Māori Women’s Development Inc. My role includes managing the loan portfolio of the organisation and working directly with clients and their whānau. I am passionate about hauora and have completed a number of triathlon events in New Zealand and abroad – Ironman New Zealand 2016 being one of them. Whāia te iti kahurangi ki te tūohu koe me he maunga teitei – Seek the treasure you value most dearly; if you bow your head, let it be a lofty mountain. The above whakatauki reflects my experience at Leadership NZ. Driving to our first retreat I was apprehensive about the journey ahead of me. I had to bow my head to a lofty mountain and allow it to flow through me. The discovery of one’s ‘self ’ has been the treasure that Leadership NZ has gifted me. The discovery, facilitated by Louise and her team and alongside a cohort of talented, committed and compassionate leaders, has made the experience transformational. I joined the public sector 13 years ago from the community sector. I wanted to have early input into decisions and processes that will ultimately impact on people’s lives on the ground. I saw the public sector and policy development as the place where I can make a difference at a systems level. I am passionate about the public service because it aligns with my own values of ‘tautua’ (service) fa’aaloalo (respect) and alofa (love). This sector provides me with a strong sense of purpose and the belief that I can make a difference for all New Zealanders, particularly for groups like Pacific who are often marginalised by the system. I came to Leadership NZ wanting to be challenged, to be inspired. I got more than that. The Programme has challenged and awakened me on so many levels. I have developed a much deeper appreciation of my own wisdom and leadership abilities. This helped me to step out of my comfort zone and led to starting a new role that I never would have considered for myself in the past. The process has given me the tools to connect more deeply with people and bring a sense of calm and clarity into situations that are often chaotic and overwhelming. The Leadership NZ experience is often hard to explain because it isn’t just about learning concepts that we already know. It is a fuller experience that includes your whole self, (head, heart, spirit) and pushes you to articulate and own the values that you bring with you. My leadership journey became more real at Leadership NZ. My nursing career began in February 2013 at Waitemata District Health Board, after completing my Bachelor of Nursing Degree at Manukau Institute of Technology. I worked at WDHB for one and half years and moved to Counties Manukau Health in 2014, after securing a role in the Renal Department where I have been for the last three years. I have gradually grown in my role to be the Acting Charge Nurse Manager of the Acute Renal Ward. With the ever-changing world of nursing, I have completed my Post Graduate Diploma in Advanced Nursing while continuing on the pathway of becoming a Nurse Practitioner in the coming years. Upon being selected to being part of the 2018 Programme, my understanding for my journey ahead was to learn how to be a better leader. However, my experiences over the year have taught me how to be a better person. The rich and emotional conversations with people from all walks of life really gave me an insight on the different worldviews that people have. This, in turn, helped me to better understand my values and principles that I live and grow by each day. The Programme exceeded my expectations and helped me to deepen my connection with New Zealand – the land, sea and people. The impact it has on the way I think, do and react to situations is noticeable and also inspiring to others around me. Leadership NZ in its own way has shown me that without continual growth and progress, words such as improvement, achievement and success have no meaning. I am both tangata whenua (Te Rarawa) and tau iwi (Croatian and Russian descent). Leaving the Far North to study IT opened a pathway to a 25 year career across New Zealand, UK and Australia. For 10 years I’ve specialised in Portfolio Management directing strategic investment and managing programme offices (PMOs) in a range of sectors. Since 2016, I’ve been exploring the Future of Work for humans and prototyping new ways of working. My brain is wired for business, but my wairua is connected to our people. 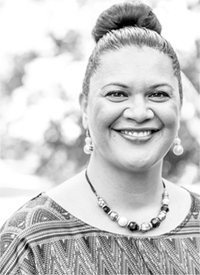 A child of Te Tai Tokerau, I am passionate about dedicating the next chapter to unleashing the potential in our rohe. Leadership NZ has been a journey to my core, an exploration of my true values and a microscope over my world view, at times uncomfortable, having to deeply assess who benefits from my perspective and inversely who does not. The themes, readings and speakers exposed us to information so compelling, once learnt it cannot be ignored. This is the magic of Leadership NZ: deep exploration of self, the curation of a talented, generous cohort, a new whānaunga with wildly diverse thoughts, ready to challenge and explore. For me personally, the Programme has been a call to action coupled with a more reflective way of learning to be my best self. Leadership NZ crafts leaders willing to use their talents, newly acquired skills and leadership practices to advance Aotearoa’s future. This Programme has been a transformational experience rich with insights, uncomfortable truths and so many laughs shared with truly wonderful New Zealanders. I am a Kiwi, born in Palmerston North and raised in Auckland where I live today with my husband and two children. 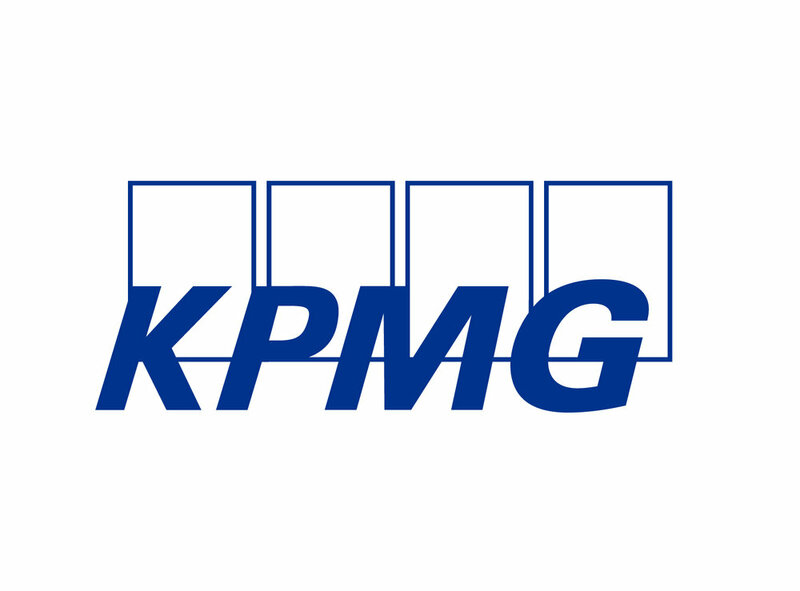 My current role is Director in KPMG’s Tax team, a team I’ve been part of for the past 13 years. No two days at KPMG are ever the same and tax itself is constantly evolving – which keeps life interesting! In my role, I’m fortunate to connect with many inspiring leaders, as well as many extremely bright and passionate people in the early stages of their career. Outside of the office, I enjoy the outdoors with my family, languages and travel. Everybody has a story. To be privileged enough to truly see, hear and accept others’ stories, we have to be prepared to be vulnerable ourselves, to listen more than we speak and to be comfortable with discomfort. These are the skills of an inspiring leader. When you truly understand someone else’s story, it is much easier to accept and work with their perspectives and opinions. Preconceived ideas and views disappear, the conversation is real, all voices are heard and the discussion can be pointed, challenging and efficient at the same time. I am immensely grateful to Leadership NZ and, in particular, to my cohort for providing a safe space to grow and challenge each other respectfully, for hearing my story, for sharing theirs and for being prepared to accept different perspectives with grace. The best part of my legal career has been advocating on behalf of vulnerable families with a focus on children and young people in the Family and Youth Courts. More recently, I have developed a practice for people struggling with addictions and their experiences in the criminal justice system. I balance my family law practice with corporate governance work. Being able to apply relevant insights at board level to influence better outcomes is something I am very passionate about. I am a Mother of four, married to an exceptional man and proud owner of a very big tabby cat. When I reflect on my journey through Leadership NZ over the last 10 months I am grateful and happily amused at some of the learnings and insights gleaned on the way. I have laughed at being able to now “name” tools that I was already using but not cognisant of. I have also learnt new tools. I wasn’t sure what to expect when I first entered the Programme, but what I am leaving with has enriched my life in so many ways–an exceptional network of friends, whom I would be proud to work collaboratively with in the future. I have had the privilege to go on retreats with some wonderful energised people who are committed to creating a better Aotearoa and world. I’m a proud New Zealand born Kiwi/Samoan who has a passion for music. This has gained national and international recognition for contemporary Pacific entertainment and academia. For 18 years, I’ve worked as a performer involved in creative enterprise whilst becoming an admitted Barrister and Solicitor to the High Court of New Zealand. Currently I consultant across public, private and not-for-profit sectors. I enjoy working with clients to achieve their goals and inspiration through innovation. My career has evolved to governance including the Ministerial-appointed National Pacific Radio Trust. I love living life alongside my husband and four young kids. I am so blessed and grateful to have had the opportunity to meet the most amazing people in this year’s cohort. They are extraordinary leaders in each of their fields whose My Lives have had an authentic and heart-filled message to go out and live to the fullest, even when the odds are against you and obstacles are constantly in your path. Keywords and learnings for me include: resilience, triggers, inner selfies, space, environment, journaling and being in the moment. This Programme has provided a unique pathway to engage, explore and understand the many different sectors and industries that make New Zealand what it is today and yet be challenged to create and shape the future as we move forward. I am truly humbled and proud to be a part of the 2018 programme and graduate a stronger, more selfassured woman. Thank you, Fa’afetai tele lava! I have worked for Downer for 19 years, inclusive of a two year sabbatical working in the UK. I started working as a general operative, and progressed through supervision and contract management before becoming a General Manager four years ago. Being responsible for around 600 staff in the South Island has been a privilege. With a unique blend of technical and people skills, I have been looking forward to challenging myself on how I can be a better leader for my team. I have enjoyed the last two to three years of Tasman Rugby governance, gaining new experiences as an independent director. The last year has flown past, and it has been one hell of a ride. There have been some ups and downs, but The NZ Leadership Programme has certainly provided some very memorable ups. I have met and built some awesome relationships with some real cool Leadership NZ whānau. My thinking has been challenged on a number of occasions, and I have learnt some new and fresh approaches that I have already started implementing at work and at home. This has had some good results and I am now very conscious of the way my leadership can affect others. Of important note is the gradual improvement of my family dynamics through my new learned way of engaging. Through the Programme I have reignited some passion for things that are important to me, such as the environment. I have realised that lots of small steps can lead to big change: it is a matter of showing some conviction and leading the way. I was born in wonderful Aotearoa and raised in Pōneke, Wellington. I studied science at Victoria University, graduating with a postgraduate degree. My career in museology was more by accident than design, and hence I feel incredibly privileged to have worked at New Zealand’s national museum, Te Papa, for the past 18 years. I have held various positions over that time and today have responsibility for a specialist team who care for our natural history and humanities collections. 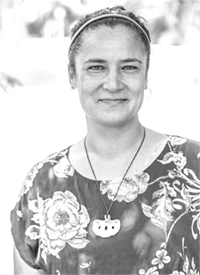 I love seeing people reach their full potential and getting excited about their work, particularly when connecting people, taonga and stories. Reflecting on completing The NZ Leadership Programme, I’m in awe of the journey I’ve been privileged to be part of this year, along with my amazing and inspiring cohort. Framing of the Programme around exploring big contemporary issues definitely rekindled my interest in the leadership challenges faced by Aotearoa. Travelling to different parts of the country and having the rare opportunity to listen to community and industry leaders speak on their topics of interest has been incredibly rewarding. I came into the Programme shy, with an open mind and willingness, but not really knowing what to expect. The ‘not knowing’ was scary but learning to feel safe beyond my boundaries has given me the growth I’ve needed. I’ve gained value from exploring my own whakapapa, learning how to be open-hearted and better appreciating that everyone has a story and vulnerabilities. I feel like I have started to reconnect with my inner and emotional self this year and look forward to continuing that exciting journey. Mother, foster mother, social worker and manager, I have led the social sector (NGO) for many years and have been a strenuous protagonist for getting the voice of children in care to be heard in the care system and reflected in practice. Reducing stigma and creating involved communities of care for children makes me get up each day! I have the privilege of working and living with children in care so my leadership journey has been a rewarding, hands-on experience. I have a background that spans aged care, residential care and foster care. I have enjoyed building skills in training and facilitation. Having been the Director of the Dingwall Trust for many years, I am now the National Operations Manager for VOYCE Whakarongo Mai. Having spent a large portion of my working life working in the care and protection sector, I have been profoundly affected by the disenfranchisement of the children in the care system in Aotearoa. My work in this sector has been about advocacy on behalf of, with and for children. One of my greatest pleasures was the process of co-designing the advocacy agency, VOYCE Whakorongo Mai, for children in care with young people. Leadership NZ has strengthened my desire to follow my dreams and take risks to find where I can make the most difference. The connection, learning and exposure to the journeys of others and the level of introspection required to understand my career and aspirations have given me the courage to seek further challenges. It has been an amazing awakening to lead more and do more. I was raised in Whangamata, a tiny, isolated, yet beautiful place. That left me with a strong sense of community and whānau. Due to this I have spent a lot of time volunteering and working in the youth development sector. My role with SCOUTS New Zealand has offered me a platform to provide opportunities for other young New Zealanders to help them thrive. My youth was cluttered with a treasure chest of opportunities, and I feel a strong calling to give back in any way I can. To get away, I love to go on hikes or take a book to the beach. At the beginning of this journey, I didn’t know what to think. I had built up a few expectations in my mind of what I might be getting myself into and felt apprehensive about whether the Programme was for me. Day one of the first Retreat blew all of my expectations out of the water! Now I look back on the year, and I’ve noticed how differently I look at the world. I no longer get comfort in the mediocre, and I am finding myself yearning for the extraordinary.